Last Spring I was listening to an organic gardening podcast and heard that the cushaw squash makes wonderful pumpkin pies, and, even better, is resistant to squash bugs. You all know all about my squash bug woes by now. I immediately ordered some seeds. I planted just one. Turns out, that was enough. True to form, the 5 million squash bugs in my garden left it alone. The cushaw squash wasn't as difficult to prep as the blue hubbard or a pumpkin would be. It is much softer skinned. I chopped it into big pieces and roasted it at 375 for 40 minutes. Then I scooped out the flesh and any seeds I didn't get the first go round. From this one squash, I made a soup in the crockpot (we all concluded that butternut makes a better soup - the cushaw squash had a slightly tart taste in soup format). 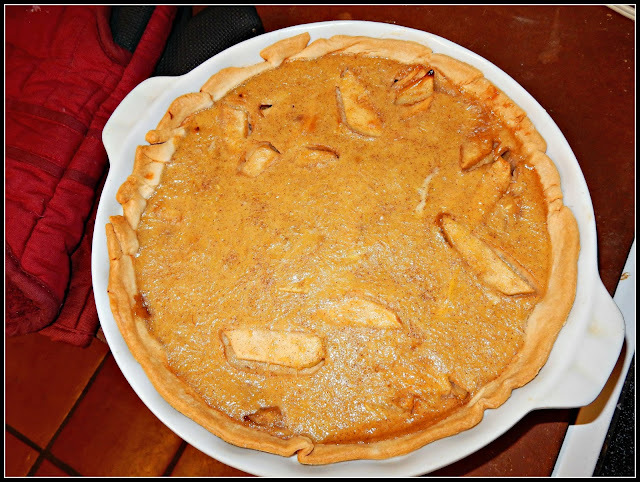 I also made a couple of loaves of 'pumpkin' bread (recipe coming soon) and a really delicious pumpkin/apple hybrid pie, using apples from our tree. The podcast I listened to said that all gardens in Appalachia used to grow cushaw, but for some reason people aren't growing them anymore, except as an ornamental gourd. Which is a shame, as they have a wonderful flavor for sweets. 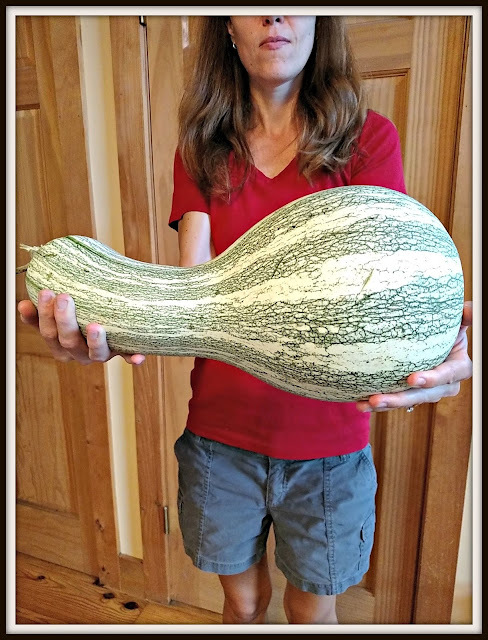 Readers, have you ever had a cushaw squash? Our family has grown them for years and never grew orange pumpkins for food as they were called cow pumpkins and fed to cattle. I grew some this year but the chickens ate them. I have switched to growing butternut squash as they store better and have a better flavor. We are talking about making a batch of pumpkin beer at the brewery and I told him to use these pumpkins or maybe butternut, of course he hadn't heard of them. My aunt great aunt who lived in the hills of eastern TN said that the people there called them "Bakes" instead of "Kershaw" or "Cushaw". I suspect they have been around since the Indians lived in the area. I've seen them but I have never eaten one. I've never heard of that type of squash. Now that I'm clearing out about 10,000 square feet of IVY I might have to start growing a few things. This sounds like a good one. That's huge. I wish my boys liked squash just as much as me. They'll eat it in a Mexican soup I make. Beyond that I get odd looks from them. They probably would devour that pie though. I don't think I've ever tried one! It looks like you had great success growing them. That squash is amazing and I'm impressed with all that you made with it! Love all your huge varieties. I haven't tried this, or knew about the bug resistance. Wow,,, so many things to do with aquash,, and there are so many different kinds. interesting! hadn't heard of it before, and glad it tasted good. That is really an amazing squash and looks very friendly for cook;ing fall goodies. Thanks for sharing. It is almost bigger than you are! until this very moment, I never heard of cushaw squash . . golly, it's HUGE!!!! I'll have to look around and see if any local growers are offering them . . .
That is a BIG ONE! Just stopping by to say hello!!! These are popular here, mostly for ornamental reasons, but some folks still eat them. I grow butternut as they seem to store better. Wow, I never knew about cushaw squash. (I'm always learning cool stuff on your blog.) One day I'll get back to gardening, and I'll remember this post! Oh my gosh- they are HUGE! I've heard the name, but have never seen one anywhere. Not familiar with it. If it produced that much and is bug resistant it is worth looking into. I've never even seen squash for sale in Ireland!! Never had one! Glad to know about it. I've never even heard of that one, but we love winter squash. My favorite is the butternut. I've never heard of this kind of squash....but goodness, it looks like the gift that keeps on giving! So glad you tried it. Lisa, gorgeous squash. This year we only planted butternut, probably our favorite outside of Red Kuri, which is the best tasting. Prior years we planted Galeux d'Eysines and Marina di Chioggia, both very nice, but... our butternut this year is the best and we still have some Red Kuri puree in the freezer. Happy harvesting.